Home » Jobs Alert » Nurses » State Govt. Jobs. 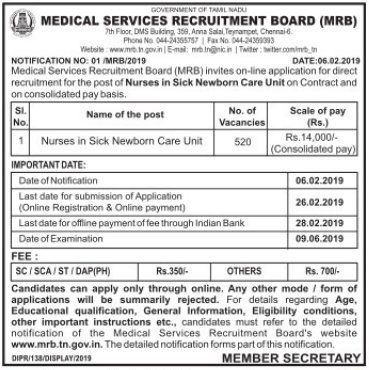 » Tamilnadu Jobs » TN - Medical Services Recruitment Board (MSRB ) Nurses Recruitment -2019. TN - Medical Services Recruitment Board (MSRB ) Nurses Recruitment -2019. Medical Services Recruitment Board (MSRB) are Invited for the Post of Nurses Vacancies. Interested candidates should apply online before the last date of 28th February, 2019.